Choose 1 or more metal choice here. 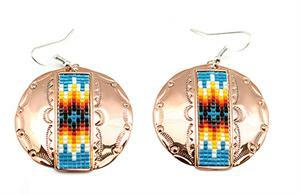 These large round earrings are made out of copper with stamping and assorted 7 rows of beadwork down the center. They measure approximately 2 1/8" long including silver plated french wire by 1 1/2" in diameter. 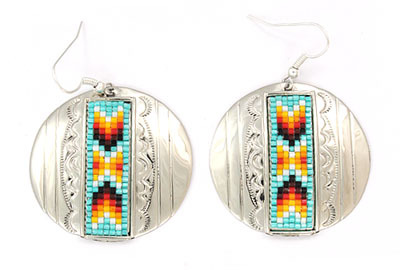 Beadwork is just over 1 1/4" long by just over 3/8" wide. 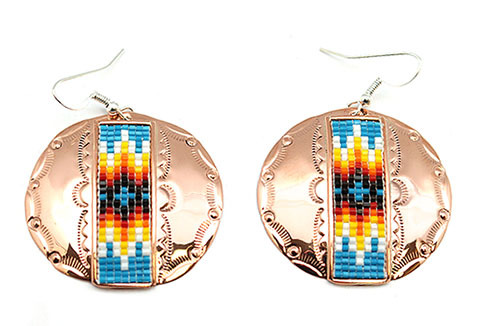 Crafted by Navajo artisan Geraldrita Whitethorne. Colors and patterns will vary. Also available in nickel silver. Choose metal when ordering.